Outbreak In Saudi Arabia Echoes SARS Epidemic 10 Years Ago : Shots - Health News Middle East Respiratory Syndrome emerged a year ago in Saudi Arabia, although the world didn't find out about it until September, when researchers said it was caused by a previously unknown virus that's in the same family as SARS. Saudi men walk to the King Fahad hospital in the city of Hofuf on Sunday. In eastern Saudi Arabia, where outbreaks of the MERS virus have been concentrated, people have resumed their habits of shaking hands and kissing. A detailed analysis of how the disease called Middle East Respiratory Syndrome spread through four Saudi Arabian hospitals this spring reveals disturbing similarities to the SARS pandemic that terrified the world a decade ago. "I think this has the great potential of becoming the next SARS," Dr. Trish Perl, one of the analysts, tells Shots. Perl, a pathologist and epidemiologist at Johns Hopkins, has some standing on that score. She found herself at the epicenter of the largest SARS outbreak 10 years ago when she went to Toronto to help overwhelmed hospital personnel there cope with a second wave of SARS. MERS emerged a year ago in Saudi Arabia, although the world didn't find out about it until September, when researchers said it was caused by a previously unknown virus in the same same coronavirus family as SARS. SARS, short for Severe Acute Respiratory Syndrome, first surfaced in China in late 2002. But the world found out only after it caused an explosive epidemic that spread from a Hong Kong hotel to more than 8,400 patients in 31 countries. Since then, SARS has gone underground. So far, the outward similarities with MERS seem slight. Unlike the explosive spread of SARS (once it escaped from mainland China to the airline hub of Hong Kong), MERS has clocked just over five dozen confirmed cases of infection in nine countries. But MERS appears to be more deadly than SARS. Sixty percent of people known to be infected with the MERS virus have died, compared to the 8 percent toll of SARS. "The mortality difference is striking if not dramatic," Perls says. The new analysis, published online by the New England Journal of Medicine, encompasses the first 23 cases of MERS that occurred in easternSaudi Arabia from April 1 to May 23. It's not clear whether the outbreak is continuing, although that seems likely. Perl says Saudi health officials, like those in Toronto, have been struggling to contain the outbreak. That may help explain why there's been no real analysis of what's happened, beyond a daily case count. "They had all hands on deck and didn't have the resources to sit down and think," the Hopkins researcher says. "That's why we were invited in. Our role was to put the story together." The main lesson is how easily MERS can spread within hospitals — even between patients located two or three rooms away. The virus can also be readily transferred, in the bodies of its victims, from one hospital to another. Those characteristics are chillingly reminiscent of SARS. Helen Branswell of The Canadian Press wire service points out that SARS turned out to be mainly a hospital epidemic. MERS also affects patients in much the same way as SARS. "It looks for all the world like SARS," Perl says. "Fever, cough, pneumonia, incubation period." Here's another similarity: Some people infected with MERS seem especially likely to spread the virus to others. In the case of SARS, such victims were called superspreaders, although Perl and other infectious disease specialists don't much like that stigmatizing term. 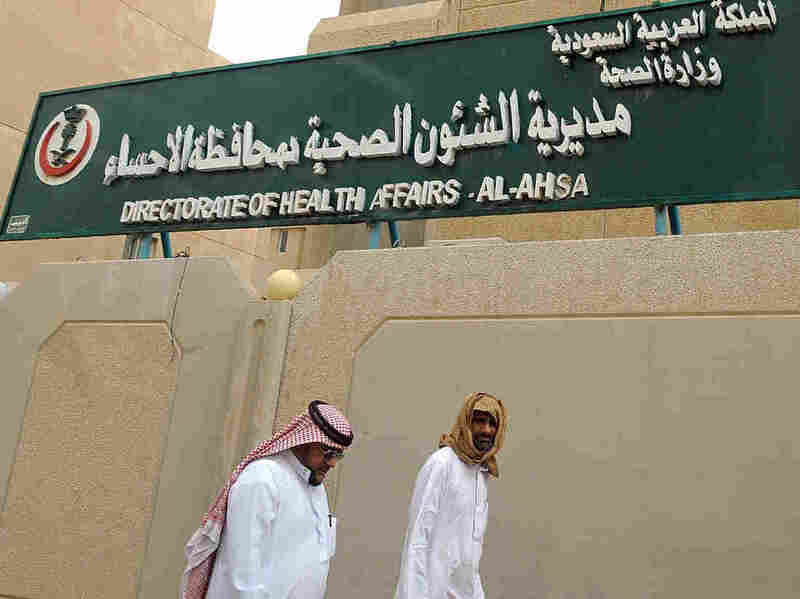 One of the cases in the Saudi hospital outbreak, a patient receiving kidney dialysis, transmitted the MERS virus to seven people — fellow dialysis patients and others. Others transmitted the virus to one, two or three others; most MERS-infected people didn't pass the virus on. The team wasn't able to work out how the MERS virus is spread — whether through the air, in droplets spewed out in coughs, or through direct contact with patients, bodily fluids or surfaces. That's an important question, because the answer would help focus infection-control efforts. The researchers say the incubation period — the time from exposure to first symptoms — is typically a little over five days, though it can be as long as 15 days. That's important, because it affects how long an infected person might be infectious to others. The MERS virus might be capable of movng from one person to another earlier in the course of the illness than SARS, they say, multiplying the opportunities for spread before the disease is recognized. One urgent need, Perl says, is for quick, accurate diagnostic tests. The current test is good, but it takes about three days to get results. "When you're trying to identify people who are at risk, three days is a lot of time for people who are potentially exposed," she says. "You try to keep them isolated, but in health care nothing is perfect." It all adds up to a troubling picture, especially for hospitals without the resources or expertise to do prompt and rigorous infection control — implementing measures including proper hand hygiene, mask-wearing, isolation of suspected patients and stepped-up environmental decontamination. Ultimately, the key will be to identify where the MERS virus is coming from in the environment. "Without the ability to prevent community infection," the analysis concludes with academic understatement, "prevention of health care transmission will remain a challenge."